"Its Fruitful!!! 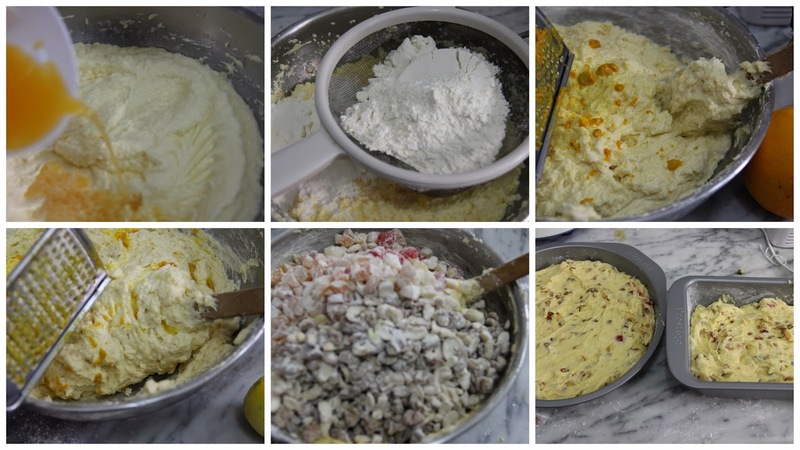 Recipe that will make you rethink fruit cake" is the caption given in a particular review about fruit cakes. Jane Touzalin works in ‘Washington Post Food and Travel sections’. She has written about fruit cakes about how it was prepared in 60’s and 70’s and now how the recipes changed. Now a days fruit cakes are doused with brandy and sometimes tastes too dry. Her review about fruit cakes convinced me to try this cake last year and it was a big hit among our family members. So I planned to make the same cake this year as well and am now sharing it with you. 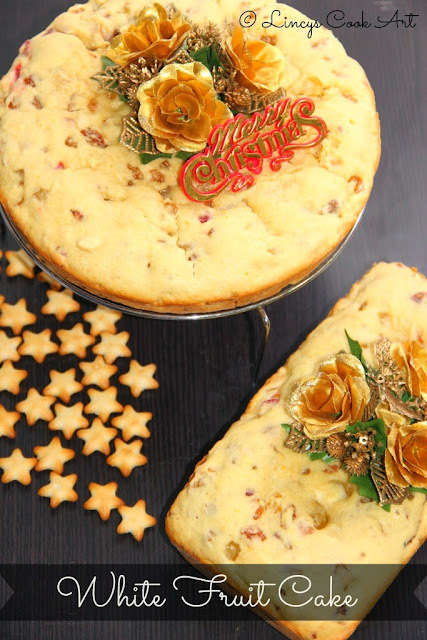 This cake is not chewy, and has no colours; Just dried fruits and nuts. The cake is rich in fruity flavor and the moistness achieved without so much as a drop of brandy. I have followed the exact recipe with small modifications. You can bake this same cake with your choice of dry fruits and nuts. *You can use self-rising flour for this recipe. If you use self-rising flour don’t use baking soda. Grease two 4 ½ inchx8 ½ inch loaf pans with butter and dust with flour (or) line with parchment paper. Can use 20 or 22cm two round cake tins. I have used here one loaf pan of above size and a 22cm round cake pan. Toss the raisins, apricots and ginger in ¼ cup of flour until evenly coated. 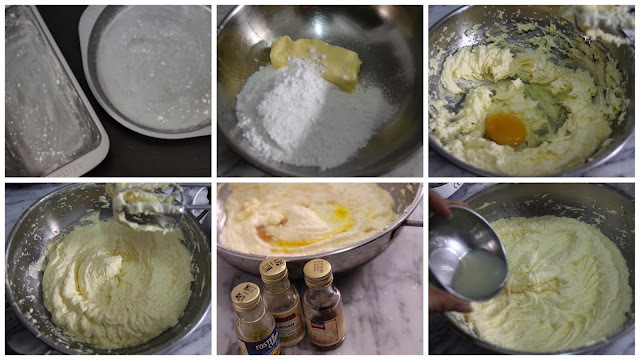 Add the butter and sugar in a bowl and beat well using electric beater or normal whisk until creamy. Then add the eggs one by one and beat well. Now the mixture looks curdled in appearance. But nothing to worry all will be well. Now add vanilla, pineapple and almond extracts and mix well. Then add the orange, lime juice and grated zest of orange & lime. Sift the remaining 2 ½ cup flour and baking powder and baking soda (add if you use all purpose flour) and add a cup at a time and mix well. 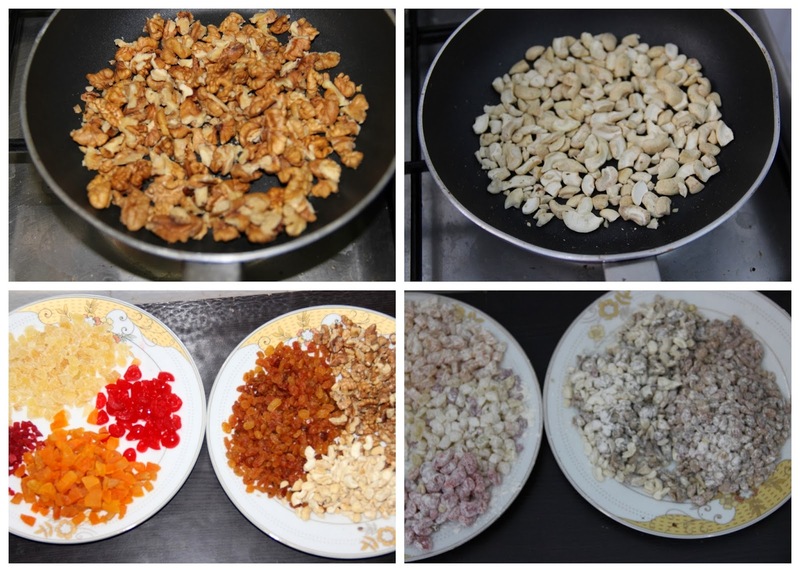 Add the nuts and dry fruits. Tap each once again on the counter to remove air bubbles, and smoothen the top layer. Check the cakes are done by inserting a skewer. The cake will be white and might give appearance of being unbaked even though they are not. Transfer to wire rack and cool for 10 minutes. U really got a perco while colour n cake Looking really lovely in with crunchy fruits.nice.. Very detailed recipe with all the picture. This looks amazing thankyou for sending it to Lets cook party food for christmas. Very new recipe for me. Usually i tried the fruit cake with caramel that looks brownish coloured. This white one looks awesome. The narration about the cake is good.